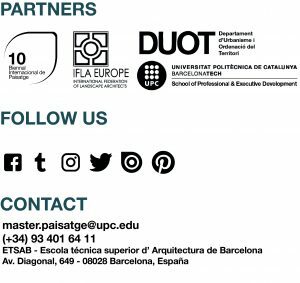 CZstudio lecture – Paolo Ceccon and Laura Zampieri – Master in Landscape Architecture Barcelona – Universitat Politècnica de Catalunya – 35ª EDITION. APRIL is World Landscape Architecture Month (WLAM), an international celebration of landscape architecture that aims to disseminate the values of our profession. The Master of Landscape Architecture, MAP, wanted to join and, therefore, we will offer a conference by CZstudio. Paolo Ceccon and Laura Zampieri will explain it at the conference: REDESIGNING LANDSCAPES.